One of my favorite dance teachers, Mary Carbonara quoted one of her teachers many moons ago and like so many pithy sayings, that one stuck with me. Perhaps because my tailbone injury has made my pelvis the site of many investigations over the years, perhaps because nearly every person who comes to my studio has some sort of something happening with their hips. Whatever the reason, it was long ago established that hips were a frequently explored topic of mine. I’ve noticed that most of us are not even aware of what is happening with our hips, let alone in control of it. When I watch clients perform many exercises it’s obvious that their hip position is foundational to proper execution, and yet folks have precious few tools with which to arrive at the ideal position. I’ve come up with a few tricks that have proved helpful, some of these are very new and some are tried and true. Any one, or all have the potential to give us more awareness and more control over our hips and as the saying goes, over our entire lives. Know the bony landmarks of your hips and be able to tune into their position at any given moment. For many years, thanks to The Franklin Method, I was really tuned into my sit bones, that afforded me a lot of pain relief and a good sense of control in seated exercises like the short box, pumping on the wunda chair, and even roll back on the cadillac. Clueing into my tailbone position has also given me pain relief, as well as control over the motion of my spine in exercises such as the roll up, spine stretch forward, and the swan (I now know better than to toss my head, shoulders, ribs, or hips rather than truly mobilizing the joints of my spine). More recently thanks to Holistic Biomechanics, I’ve increased my awareness of my pubic bone and that has done wonders for my awareness of my pelvic position with respect to my spine and legs, and refines my execution of footwork, leg springs, and stomach massage. I carry the awareness of these bony landmarks out into my daily life. When I’m sitting, I know the ideal point of contact between my sit bones and the surface on which I sit and after many years I can finally feel the effects all the way up my spine. When I bend over, I think of the motion of my sit bones and the decompression of my sacrum. That takes the load off the rest of my back and allows me to leverage the full power of my hip joints for lifting my toddler or a load of laundry as the case may be. My pubic bone awareness has given me a whole new platform for bladder continence, and for that I’m very grateful. Don’t sit in your hips, sit on your hips. I already made the point about sitting on the hips, in this case the sit bones. I think that sitting is a good place to start because there is some feedback from the surface on which one is seated. Ideal pelvic position while seated eventually leads us to the bigger challenge of proper pelvic position while standing. I’ve come to think of myself as sitting in my hips when they are sort of slumped back behind my legs. Many many times in a day I catch myself slumping and bring my hips up on their rightful pedestals, atop my thighbones. This is relevant anytime we are standing but particularly in going up front, swedish bar stretches, the foot corrector, and the 2×4, since in these cases the precise position of the hips influences which muscles will engage. When duty calls, brace from the base. Apart from being beneficial on a functional level, we can leverage all this knowledge when there is real work to be done. Having a keen awareness of our pelvic position is at first therapeutic, but ultimately empowering. Over and over again I’ve seen the effects of adding a boost of pelvic power to a Pilates exercise. As with all muscular engagement in Pilates though, bracing from the base requires a delicate execution. It is not merely a matter of squeezing the seat as that will disrupt the pelvic position. Nothing short of the complete coordination of the musculature of the thighs, buttocks, abdomen, and back is our ultimate goal. And I do believe that building an ever increasing awareness of our pelvic position primes us for such control. I’d love to hear what others have discovered with respect to this topic. I realize that its sort of a hot one in the Pilates world what with the tendency for position to become our focal point. Please share any relevant thoughts in the comments. As always, thanks for reading. 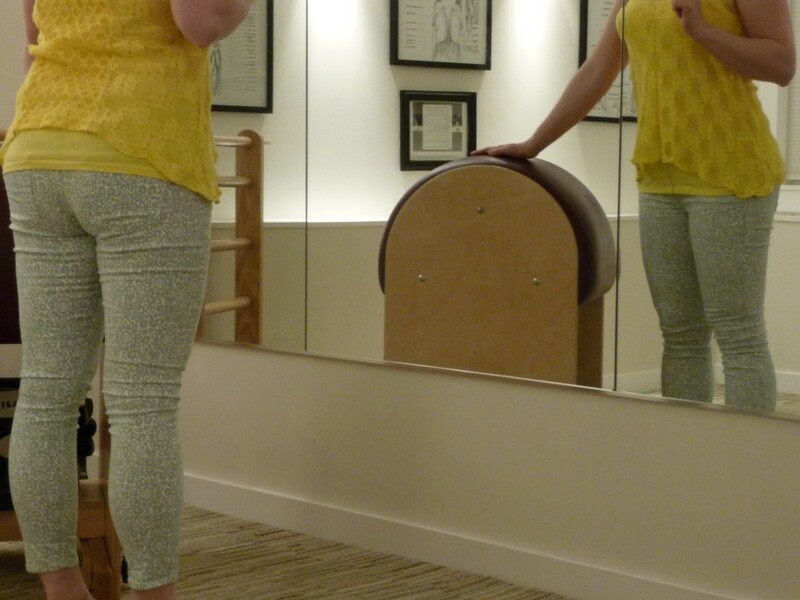 This entry was posted in Pilates FKA Contrology, the Art of Control on March 5, 2014 by elizatwist.